Jeremiah Parlock, a junior political science major and member of the Student Government Association, rounds the last bend of the We Will Run For You 5K route. Parlock was the second runner to finish the race. 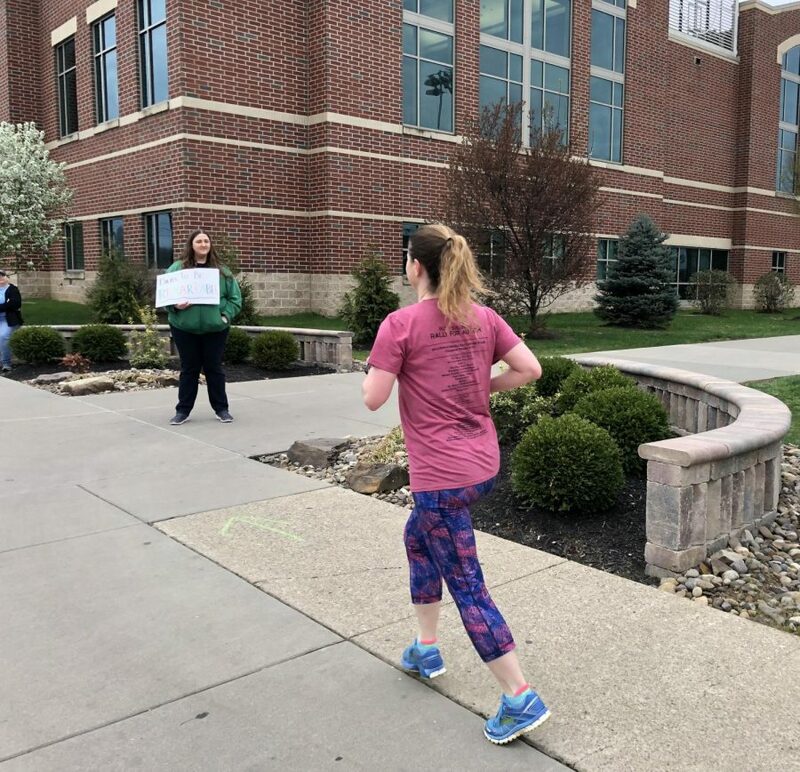 Morgan Conley, a mental health specialist for Marshall’s Counseling Center and volunteer for the We Will Run For You 5K, holds up a sign to encourage a runner participating in the event. 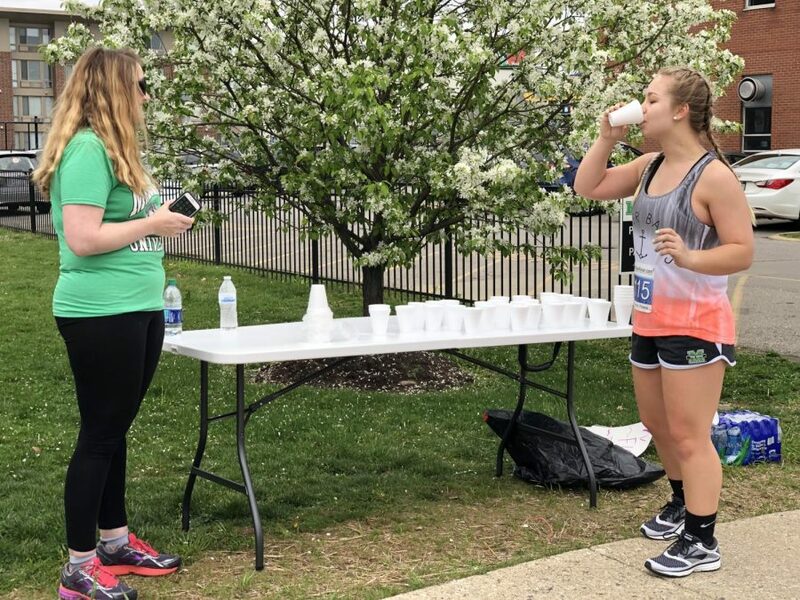 Alyssa Parks, a freshman political science major, stops for a drink from the hydration station worked by volunteer Michelle Biggs, during the We Will Run For You 5K. Pushing one child in a stroller and clutching another to her side as she raced, a mother and Marshall University faculty member participated Saturday in the We Will Run For You 5K alongside other members of the Marshall community and tri-state area. Individual runners, parents pushing children in strollers and pet owners racing alongside pets participated in the event that was organized with the goals of raising money and support for Marshall’s Counseling Center and creating “an environment of openness for mental health awareness,” according to Sarah Harmon, an organizer of the event. 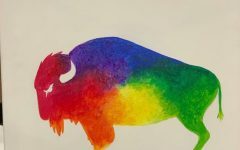 Harmon, a senior marketing major and business manager for Marshall’s student body cabinet, said she thinks the 5K, which started and ended at the Marshall Recreation Center and had a route mainly on the exterior sidewalks of Marshall’s campus, was a success. 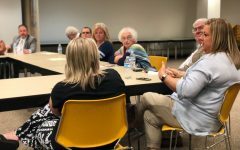 The event had a larger turnout than what was anticipated, Harmon said. She said energies were up during the event, music was going and everyone was laughing and having fun. During the race, a hydration station and snack table were set up for participants at the halfway point and end of the course. 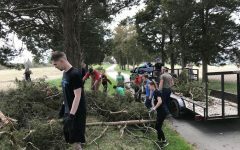 Volunteers from Marshall student organizations, the Counseling Center, the Student Government Association and Student Affairs also provided support and guidance for participants along the route of the 5K. Harmon said she’s graduating in the fall and won’t be in student government next semester, but she’s hoping that whoever is in change of the event next year she will get to work with them on what has become a “passion project” for her if they have any questions or want any help when they plan it next year. Cyphert said she included her children in Saturday’s 5K because she thinks it is fun to do events with them and is good for them to see what their mother does so one day they will be excited about physical activity and keeping fit. She said she would participate in the 5K again if it were to be held again. 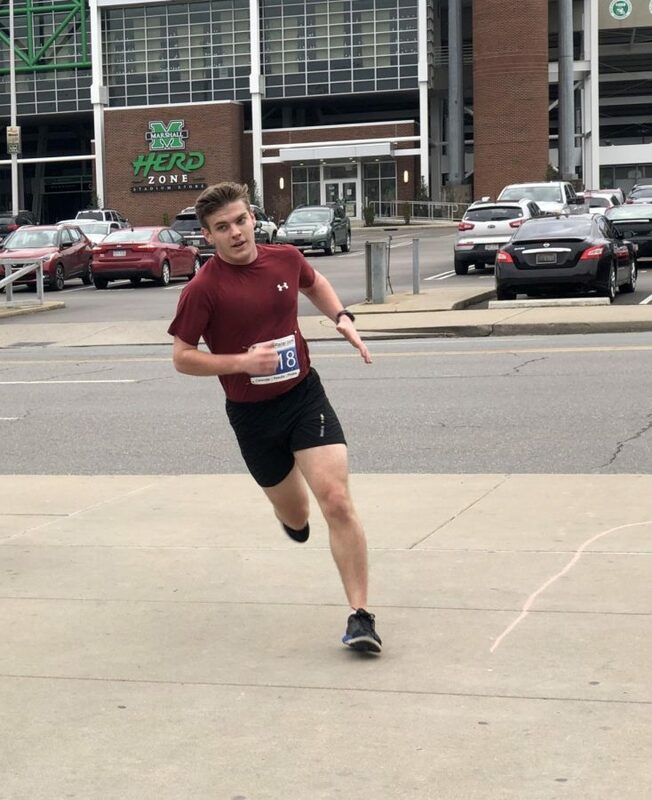 The first three finishers at the We Will Run For You 5K were Marshall students Will Sheils and Jeremiah Parlock and Marshall faculty member Eric Migernier.